Today I'll be sharing with you one of my all time favorite recipes. 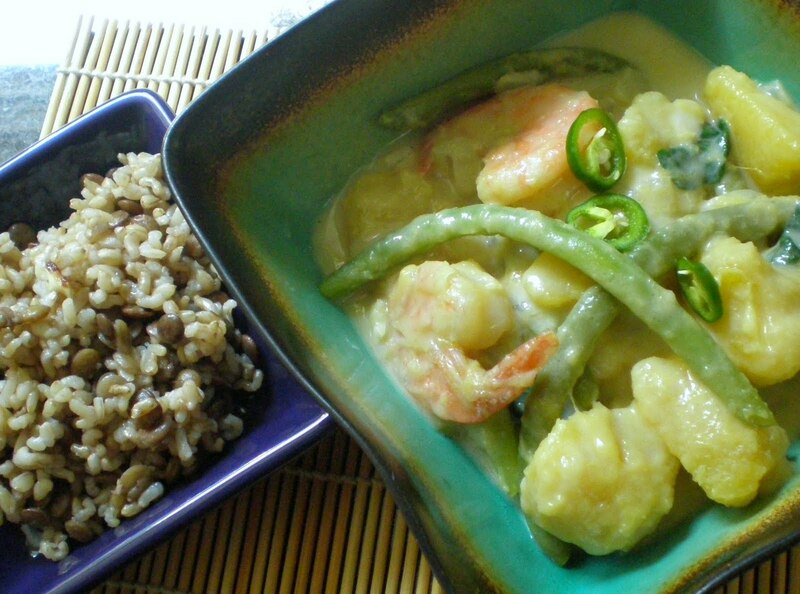 It's a traditional Filipino dish called Ginataang Kalabasa at Sitaw, which translates to Coconut Stew with Squash and Green Beans. 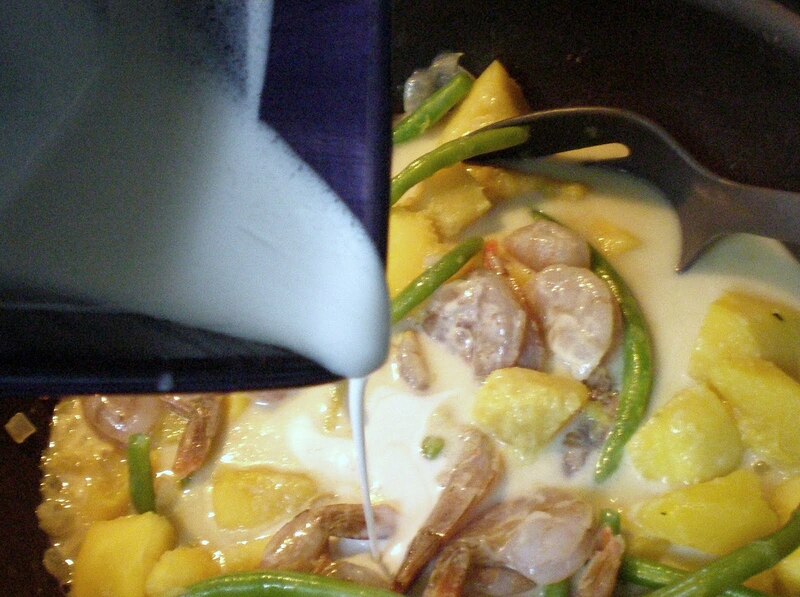 The instant the taste of rich coconut milk infused with garlic and ginger hits my palate, I'm transported back to wonderful childhood memories of cooking with my grandmother, prepping vegetables while she quietly sang church hymns. Closing my eyes and thinking about it I can't help but smile. Knowing how much I enjoyed eating this dish, my grandmother would often ask me to "assist" her in making it. Sometimes it would take us all afternoon, beginning with choosing the ingredients, then cleaning and prepping them, and eventually cooking them. But it was never rushed, each step was made important, and we took our time. "Haste makes waste" was one of my grandmother's favorite mantras. She taught me to really appreciate the ritual of cooking, which probably explains why I find the kitchen to be such a refuge when I'm feeling upset, stressed, or spread too thin. Preparing a dish like this is a perfect way for me to relax, center, and just breathe. Y'know when people ask what your "last meal" would be? 1. Start with your squash. Cut in half and scoop the seeds out. I used 1 1/2 large acorn squashes, but Kabocha and Buttercup also work well. To make prep easier, I recommend microwaving the halves on a large plate, skin side up with 1-2 tsp water, for 3-4 minutes. Once cooled, cut the skin away and make 1" cubes. 2. 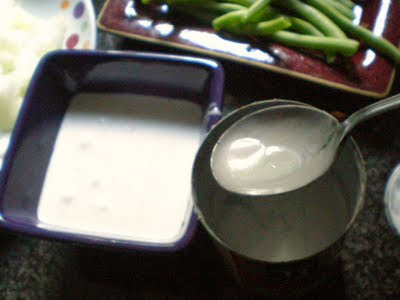 Open can of coconut milk and separate the cream from the milk. The cream is the thick part at the top and the milk is the thin, clearish liquid underneath it. Carefully scoop the cream out into a separate container. 3. Warm oil in a large wok pan or pot. Saute onions over medium heat for 2 minutes or until translucent. 4. Add garlic and saute for 1 minute, then add minced ginger and repeat. 5. 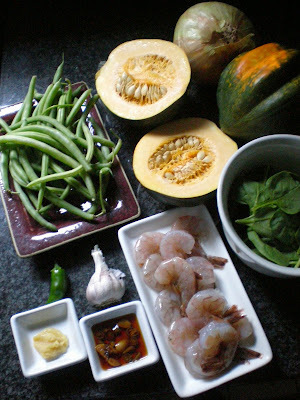 Add squash and saute for 2-3 minutes (add more oil if necessary). Then add green beans. 6. Pour stock, coconut milk, fish sauce, and GF tamari over vegetables. 7. Bring to a boil and then reduce temperature and cover tightly. Let it simmer over low to medium heat for approximately 15 minutes. 8. At this point, squash should be tender and should "flake" given gentle pressure. Add shrimp. 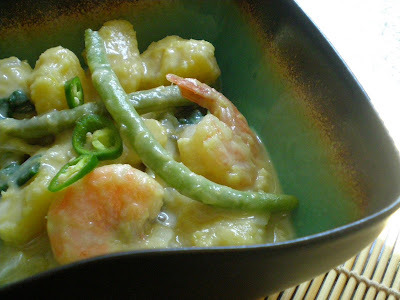 I prefer to cook the shrimp in their shells, as this imparts a wonderful, rich flavor to the coconut sauce. But if you're preparing this for guests and want the flavor but not the messy hands, you can shell the shrimp first and then tie the shells up in a cheesecloth satchel. 9. Add coconut cream and mix well. It is important to avoid boiling the stew once the cream has been added. Boiling at this point can break the sauce and give it an unpalatable, curdled appearance. Cook until shrimp have changed color and are nearly cooked all the way through. 10. Finally, stir in spinach leaves and turn the heat off. Remove from heat source and allow the residual heat to gently cook the greens. 11. Serve it over warm rice or noodles. An option is to garnish with thinly sliced chile pepper. Hatch, anaheim, jalapeno, habanero - it's up to you. Cooking together and then eating together are very important to the culture I was raised in, and I've been able to do both many times with this dish. I particularly enjoy serving it at dinner parties or potlucks where we get to eat family style: passing the food around, collectively sighing upon the first bite, excitement and love buzzing in the air, smiles and laughter all around. It's in those moments that I'm reminded that one can be rich without being wealthy, and that sometimes, in our rush to get ahead, we can miss out on the beauty and splendor right under our nose. 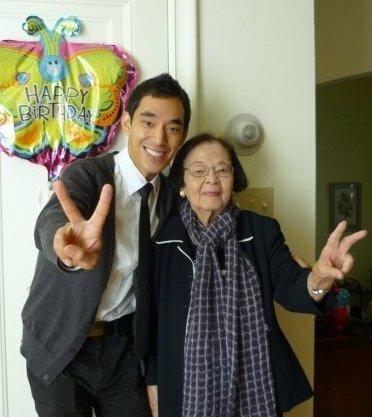 Sitting at that kitchen table with my grandmother, I learned a lot about cooking, but I also learned a lot about living. When your to-do list seems a mile long and there don't seem to be enough hours in the day, stop...and make time. Make time to breathe, make time to slow down, and make time to enjoy the simple things in life. She's 102, going on 103 and still jetsetting around the world, so I'm pretty sure she knows what she's talking about. This recipe makes me so happy, in both my tummy and my heart. I hope it will do the same for you and your loved ones. Not only does this sound so delicious, we have the same bowls as well! Lovin green beans right now. You just made my top 10 favorite food blogs. Super awesome to have such a strong focus on eliminating the potential allergens. We are cleansing right now and it makes it far easier when we can have reliable foodie sites to refer to!